At the beginning of the IIHF World Championships, co-hosted this year by Sweden and Finland, Team USA appeared to have one of its strongest teams of recent memory. However, with that said, many people were still left wondering whether the United States had the firepower to compete with the likes of Canada, Russia and Sweden. After the first two games of the tournament, the Americans have clearly shown that they not only can compete with the powerhouse teams, but that they are also a serious threat for a medal. The U.S. opened the tournament on May 4th with a 7-2 pasting of France. Although the French team scored the first goal, this game was never really in doubt. The Americans were able to use their speed and talent to overpower Team France, who had to resort to taking six penalties in order to try to slow the Americans down. As is usually the case with a 7-2 win, there were many positives to take out of the game for the winning team. Team USA was able to pepper French goalie Cristobal Huet with 35 shots, while only giving up 23. 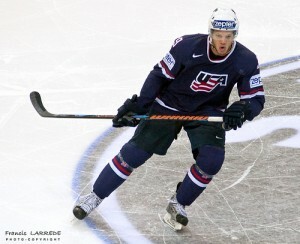 In addition, the U.S. got production from its top trio of Bobby Ryan, Paul Stastny, and Max Pacioretty. Ryan scored a goal, Stastny recorded three assists, and Pacioretty added a goal and three assists, as the 1st line combined for eight total points. Kyle Okposo also joined in on the fun by scoring two beautiful goals; the second an incredible pinpoint shot into the top left corner of the net. If Okposo can keep playing at this pace he can be an absolute force in this tournament. With his size and skill, Okposo alone makes the second line a threat to score every time they touch the ice. The U.S. would continue to make a statement in their second game on May 6th against Canada. On paper, the Canadiens looked to be the stronger squad, with big names all over the roster including Ryan Getzlaf, Corey Perry, and Dion Phaneuf. However, as the game played out, it was clear that this U.S. team was up to the task of competing with their northern neighbors. The Americans struck early as Jim Slater wristed a shot past Cam Ward, just 1:10 into the first period. Surprisingly, the United States dominated the opening two periods, controlling the majority of play and outshooting a talented Team Canada 32-19. Even with their dominating performance, the game was tied at 2-2 after two. Team Canada picked up their game in the third and began to take control of the game. However, the U.S. didn’t back down and the third period ended tied at 4-4. With one second left in the final frame, Team Canada’s John Tavares would take a delay of game penalty, which would lead to Jack Johnson’s overtime game winner, just 1:47 into extra time. Perhaps the biggest surprise of the game came from Team USA’s fourth line. The trio of Joey Crabb, Patrick Dwyer, and Nate Thompson provided both an energy spark and secondary scoring, as both Dwyer and Thompson converted opportunities in the third period, with Dwyer’s being a shorthanded tally. This line appears to have found some early chemistry and should begin to see more ice time as coach Scott Gordon begins to trust them more. What has not surprised anyone with regards to Team USA is the play of Jack Johnson. The team’s number one defensemen and captain has been downright dominant so far in the World Championships. Johnson opened the tournament by scoring a goal against France, and then added two against Canada, including the game winner in overtime, while also playing more minutes than anyone in the entire game (25:44). Whether it’s the bigger ice surface, or being in a featured role, something about playing for Team USA seems to bring out the best in Johnson. With Johnson leading the way, the Americans were able to beat Team Canada for just the fourth time in 42 meetings at the World Championships and the first since 2001. After the first two games, the U.S. leads the Helsinki group with five points through Saturday’s action. More importantly, Team USA has proven to themselves and the rest of the field that they can compete with and even outplay one of the best teams in the tournament. Moving forward, the U.S. will play Slovakia on Monday and Belarus on Thursday. However, with its biggest test of the preliminary round out of the way, the U.S. can be confident that they are indeed capable of winning a medal this year.